Another film that appears to have been unfairly maligned, perhaps due to the malingering taste left from The Village and critics writing Mr. Shyamalan off as the “One Twist Wonder.” I certainly had fallen into the latter camp, but coming into this movie despite the negative press, I can say that I found a space in which to enjoy this film. Basically set-up as a bedtime story from the opening narration and animation, Shyamalan is telling us to set aside serious critical thought and forgive leaps in logic and suspend our disbelief for a fantasy film. It is a shrewd maneuver even if a bit arrogant in its attempt to be critic-proof. The film introduces Mr. Heep (Paul Giamatti) as the superintendent of an apartment complex in Philadelphia. He is kindly and helpful and has great rapport with the tenants. The tenants are a mix of types mostly charming with their personality quirks. You’ve got Jeffery Wright as the cross-word puzzle king, Freddie Rodriguez as a body-builder only working on his overly-developed right arm, and Bob Balaban as the newly moved-in critic. 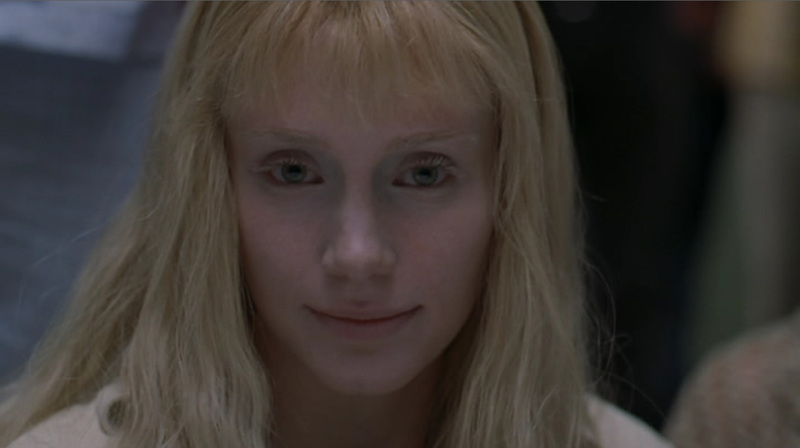 Then, one night while investigating a disturbance in the pool, he discovers a mysterious half-naked Bryce Dallas Howard who tells him that her name is Story. While attempting to take her outside, they are intercepted by a grotesque grass-dog and retreat back to his apartment. As the film progresses, Mr. Heep learns that Story is a Narf from The Blue World and that the grass-dog is a Scrunt seeking to prevent her from returning to her world. He learns most of this through the bits and pieces of story fed to him by Mrs. Choi, an elderly Asian lady, and her daughter Soon Young (Cindy Cheung). While its a bit too convenient how the information gets to him and when he gets them, what is important is that he soon learns that Story was meant to contact The Vessel (turns out to be M. Night himself, har-har) who will initiate great change. Once that is accomplished, she has one chance left to return to The Blue World (conveyance by means of The Great Eatlon, an eagle) and that certain humans with powers are meant to help her. The film does a great job of creating expectations of who these particular people are and subverting them. While it is a bit of a twist, or cheat, that the director is known for, it is a more elegant one than the previous twists of his past films. What really shines here, as in The Happening, are the actors he has assembled. Not just Paul Giamatti who is excellent as usual, but all the secondary characters are filled with interesting players. Bryce Dallas Howard is capable as Story — she looks gorgeous as a red-head and a blonde — even if her role is somewhat limited in growth. And while many may feel that M. Night casting himself in The Vessel role is a conceit, he proves to be bearable. Bob Balaban is always fun to watch as the critic, though he is not nearly as nasty as he could have been for his fate to feel as justified as, for example, when the lawyer in Jurassic Park meets his fate. And Sarita Choudhury, looking lovely, is also great fun as M. Night’s character’s sister. What’s interesting to note is how M. Night handles groups of characters in this one, in terms of staging and character work. It definitely feels like his most Spielbergian effort to date. Even the score by James Newton Howard calls to mind the Spielberg touch. So, with its built-in disclaimer, this movie is entertaining with a great lead performance and quirky, amusing secondary characters. The fantasy aspect is light on explanation, but we are fed enough information to follow it without seriously scrutinizing it before it falls apart. I am glad that this movie did not stink and have a little faith restored in M. Night Shyamalan.